Owning and/or operating a building or set of buildings can be overwhelming. Not only must the facility be managed and maintained, but the building needs to be kept fully occupied, so revenue potential is maximized. The good news is, FM360 provides services to help with both aspects of building ownership. FM360’s property/tenant management keeps multi-tenant buildings operating at peak performance while generating revenue for the owner. Leasing—The FM360 team helps you find new tenants by marketing your space, bringing you qualified offers, and managing the entire process down to scheduling and handling showings. Rent Collection—We act as the owner’s representative for collecting rent and managing any tenant payment issues, including collecting late fees and tracking delinquencies. Accounting—Our team provides weekly or monthly reporting, including income/expense statements and year-end operating expense reconciliation. Utility bills can be handled as pass-through expenses. Complete revenue transparency is guaranteed. Annual Operating and Capital Budgeting—This important annual planning process can be completely handled by the FM360 team, including planning for real estate taxes, necessary maintenance, and prioritization of construction projects. What are the benefits of using FM360 for property/tenant management? Single point of contact: One phone call connects you with all the services you need, eliminating the hassle of managing all the pieces and parts. Our property/tenant management services eliminate additional fees, overhead, and the middle-man – all of which can reduce your margins. Access to professional services: Our tenant leasing services include access to commercial real estate search tools, signage, brochures and other marketing tactics to help expedite finding and signing new tenants. Maximized revenue: We understand that unleased space is lost revenue, so we endeavor to keep your building fully occupied. In addition, our facilities maintenance resources can be used to keep your building in optimal condition, saving you money on repairs and maintenance. Well-maintained and attractive building spaces justify higher rents. “With 13 other offices besides our headquarters building, we simply don’t have the bandwidth to invest the time necessary to handle leasing, bill paying, and working with outside vendors and contractors. On top of that, there are many technical aspects such as the building management system and HVAC equipment like boilers, cooling tower, etc. that are critical to our building’s operation. RLG’s FM360 involvement at the downtown Toledo Hylant headquarters building includes tenant management, facilities and HVAC maintenance as well as construction services. 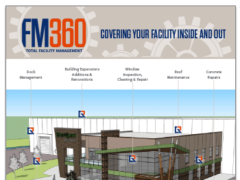 RLG’s FM360 offering provides a seamless, turnkey set of services to keep multi-tenant buildings operating at peak performance while generating revenue for the owner. Whether you need tenant management, facilities maintenance, or construction services, FM360 can provide a wide variety of service levels to meet your needs, be it temporary or permanent.